Making perfect wine match after perfect wine match is all in a day’s work for California sommelier Kathryn Coker. Here’s how she picks the right bottle for everything from sliced steak with tomatillo sauce to shrimp-and-pork wontons. When most people leave for work in the morning, they head to a job. Kathryn Coker heads to four. 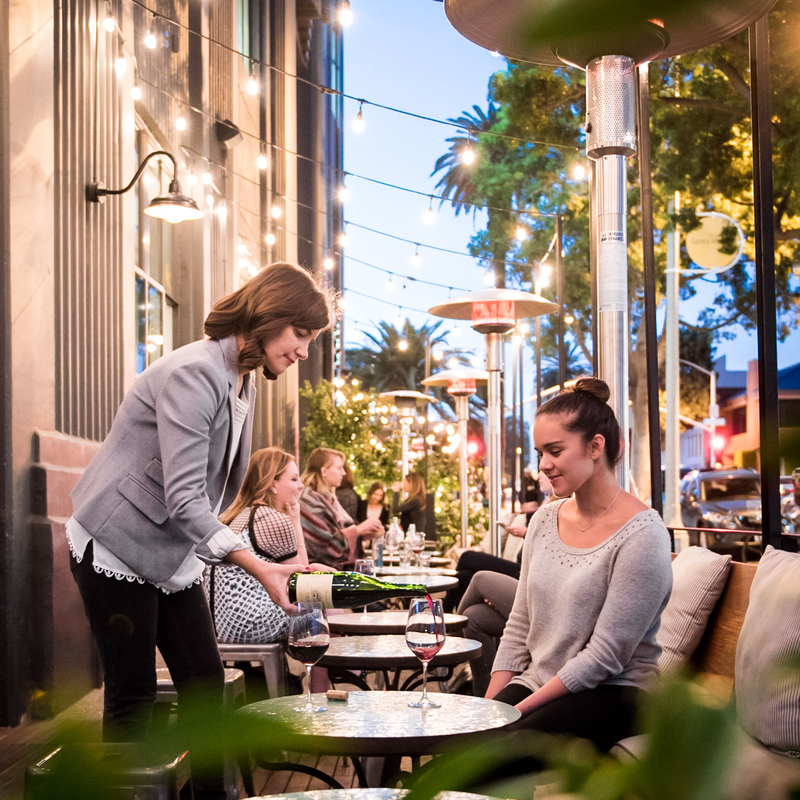 Because she oversees the wine for all of the Santa Monica restaurants in the Rustic Canyon group, she’s constantly on the move. While the four core restaurants are all within 10 blocks of one another, their cellars couldn’t be more different. At the flagship Rustic Canyon, California dominates the wine list. Light, lunch-ready bottles are the focus at Huckleberry, while Cassia’s list was built with Southeast Asian flavors in mind. Finally, there’s Esters, the Old World–inspired wine shop and bar that Coker and her husband, Tug, co-own with the Rustic Canyon group’s Zoe Nathan and Josh Loeb. When it comes to finding the right wine for a dish, Coker has to turn on a dime. 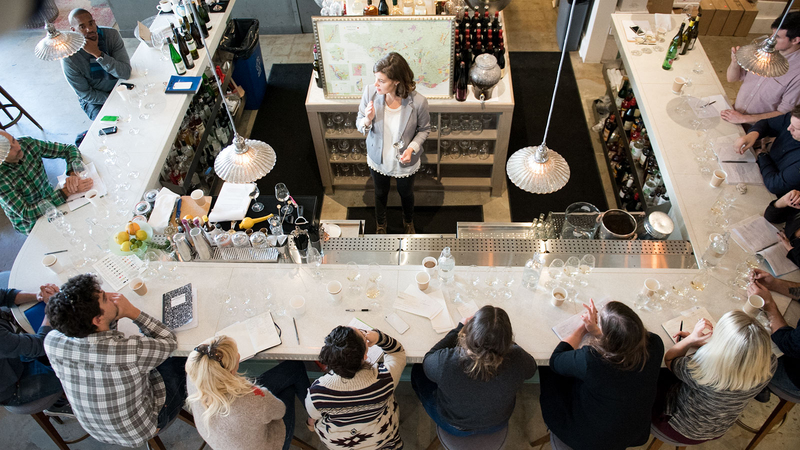 We followed her on a typical Wednesday to find out how she does it—and learned a few pairing lessons along the way. Alarm goes off. Out the door by 7:36 to book it to Esters. Arrive to find the electrician waiting for me. He’s here to fix the dimmer in the bathroom, which has been creating a strobe effect. I head to the cozy corner with the green velvet couch to begin my first round of emails—putting together a few custom gift boxes of bottles and artisanal snacks, and finalizing the wines for next week’s private party. Walk to the farmers’ market on Arizona and Second for flowers. It’s a zoo! I buy all hot pink to add color to the retail table at Esters: Oriental lilies, cockscombs and snapdragons. Run into Chef Jeremy [Fox] and pass him $240 for sturgeon. He tells me that for his new charcuterie plate at Rustic Canyon he’s making zampone with figs and Parmesan. It’s his version of the classic stuffed pig trotter from Italy’s Modena region. I immediately start thinking about what to pour with it—something tart and clean to play off the funkiness of the meat. Maybe a sparkling pink Gamay. The Turbullent from Domaine Sérol might be perfect. It’s from the Côte Roannaise, one of the youngest and least-known wine appellations in the Loire Valley. Time to set up the maps behind the bar for this week’s staff wine class, on Chablis. 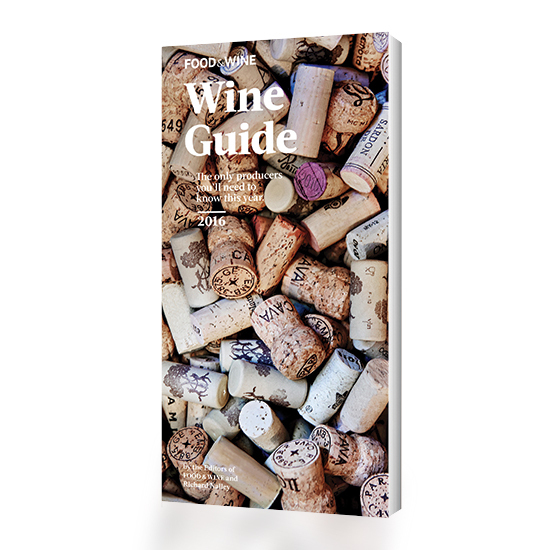 I encourage the servers to focus on a producer, to get a sense of what that winemaker’s style and commitment are… to understand the story behind the wine. Then they can relate that story to the customer in a way that feels personal. I find it to be a more engaging way to learn than simply going over facts and figures. THE FIRST BOTTLE WE TASTE: 2014 Domaine Christophe et Fils. The producer, Sébastien Christophe, took over his grandfather’s 1.5-acre estate in 1999 and started buying up more parcels—whatever he could afford. Now he’s up to almost 50 acres of vines in choice plots and making Chablis in a really lean, racy style. His basic village wine has exactly what people look for in Chablis: that nerviness, an almost electric energy. I ask the team what dish from our menu they’d recommend pairing the wine with, and I get back a unanimous “Sablefish.” Smoked, spicy, spreadable fish in a jar. The smokiness and richness of that fish and this minerally, minerally wine—so good. Chef Bryant [Ng, of Cassia] drops off a sample of Torres black truffle potato chips he wants me to buy for the bar. Salty, crunchy and truffly—they’d make a killer snack with Champagne. Walk to Rustic Canyon to find out that my Château Rayas allocation came in! I’ll snag two bottles of this Châteauneuf-du-Pape for Esters and keep the other four for RC. Chef Jeremy pops into the office to say he put up a flatiron steak at the pass for us to taste. On the way through the kitchen, one of the cooks slips a quarter loaf of panforte, a spicy Italian fruitcake, into my bag. So sweet! PAIRING CONUNDRUM. Chef Jeremy has such range. He can cook vegan, and he can make steak. And what’s crazy is that his vegan Beets and Berries is so hearty while his flatiron steak, sliced thin and topped with tomatillo sauce, is so light. At first I’d thought a Chinon would be a great match for the steak, but now I see it would be overpowering. So I crack open a 2013 Cruse Wine Co. Napa Valley Valdiguié. It’s delicate but also juicy, the closest thing California has to Beaujolais. It’s more easygoing than any of the Chinons I would have poured, and it smells a little like pickled onions in the glass…which goes with the dish. And then it opens up to a kind of plumminess…which goes with the dish! I check in with Tom Wood, our sommelier at Esters. We want to beef up the Champagne section to be ready for the Easter and Mother’s Day crowds, so we discuss possible additions, including Larmandier-Bernier and some of his other favorite grower-producers. Should we list Champagne by regions like Côte des Blancs? Or by specific villages, like Avize? Not sure yet, but I definitely want to organize it by geography rather than by price. At Cassia. My favorite server is working on nailing down his “pocket wines”—the five or 10 wines he has at the ready whenever a guest needs suggestions. The server wants to know a good substitute for Riesling, and I suggest the Patrick Charlin Altesse from Bugey, near Savoie in the foothills of the French Alps—that wine is so aromatic and craaaazy! It’s beautiful, tropical and floral, but dry. Wines like that are awesome with Asian flavors. Our architect sits down at the patio to order a glass of Arneis, a white from Italy’s Piedmont. Here’s my in to talk about a cellar redesign! We want to add a bar cart and stools for private tastings, and I desperately need a ladder; two nights ago I had to stand on a stack of boxes to grab a bottle of 2010 Raveneau Butteaux Premier Cru Chablis. The dinner rush! I polish glasses, run cheese, open bottles. Chef Bryant shows off a dish he has been toying with using mee—Asian noodles. Time to break out some wine. The first bite of the mee is cheese, mushrooms, garlic. Just like pasta! But the next bite: scallions, bean paste, oyster sauce. After a few wine misses, I finally find a pairing that works, the 2013 Girolamo Russo ‘a Rina Etna Rosso, made from organically farmed Nerello Mascalese grapes on the slopes of Sicily’s Mount Etna. It has just a hint of smokiness and a funkiness that works with the mushrooms, but it’s light enough to let the other flavors in the dish shine through. I don’t naturally think of Italian reds as being right for Asian flavors. Whites, maybe—the brighter, leaner kind. But with this dish, the Etna Rosso is perfect. Head to Rustic Canyon for a late-night bite with Tug and a Rosemary’s Baby cocktail because I’m totally wined out.